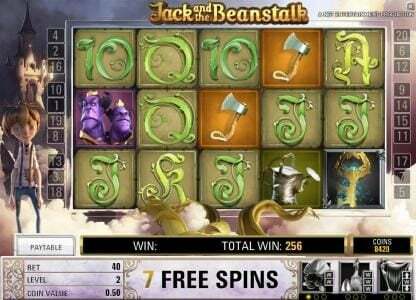 Jack and the Beanstalk is a free 5 slot reel slot with a max payout of $15,000 using the fantasy theme. 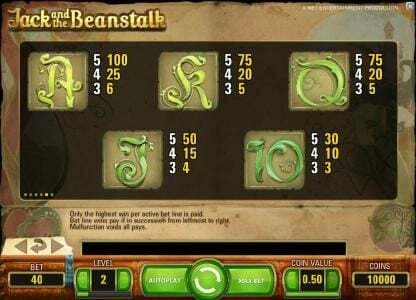 Jack and the Beanstalk Slots 5 out of 5 based on 2 ratings. 2 user reviews. 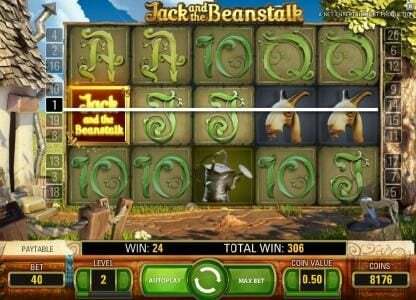 Jack and the Beanstalk comes with 5 reels and 20 paylines and it’s a slot machine created by Net Entertainment, which offers players a jackpot of 30,000 coins, or $15,000 cash. 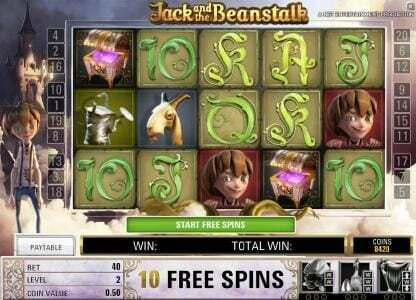 Among the standard features included in it you will find the wild symbol, Free Spins, multipliers and the scatter. 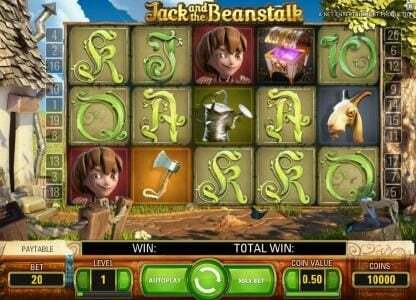 The theme of this slot machine is based on an old story, which you probably know already. It involves a poor boy, called Jack, which got some magic beans in exchange for his cow. The beans, when watered, become huge, reaching the skies and the land of giants. 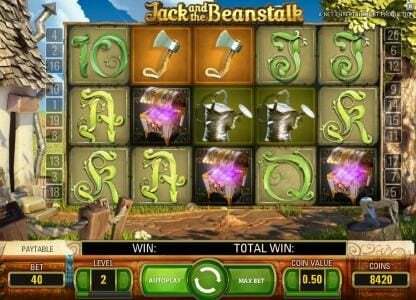 The slot shows the player that fairy tale land and the adventures of Jack. It has very nice graphics and it includes symbols like goats, treasure chests, axes and poker symbols which have the shape of bean trees. 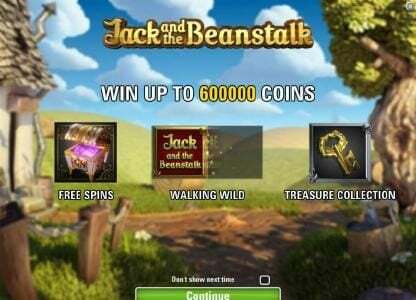 All come together to offer the player an immersive experience, one that can also be profitable, thanks to the scatter which offers free spins, and the walking wild, which is a feature that is well designed. The player is allowed to place up to 200 coin bets, with the bet range for them going from $0.01 to $0.50. The overall betting range starts at $0.01 and goes up to $100. The maximum jackpot in coins is 30,000, while in cash its $15,000. 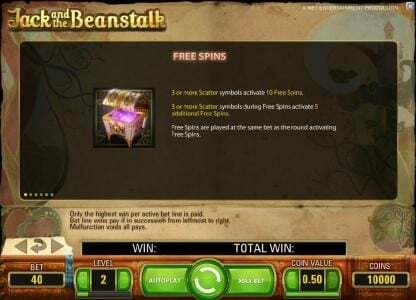 The free spins feature is triggered when the slot shows a minimum of three treasure chests, which is the symbol for the scatter, and there are a total of 10 spins offered for free. As you’re using the free spins, you can win another 5 free spins, if you get the scatter symbols again. 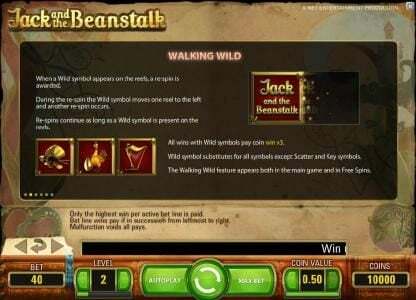 With Walking Wild, the Slot machine allows players to turn smaller wins into big ones. With this feature, the wild moves from the right reel to the left one during each of the spins, and at one point it disappears. What this means is that you can use that wild symbol multiple times, for as long as it moves on the reels, helping you create winning combos. The third feature that one should pay attention to is called Treasure Collection, which includes three types of wild symbols. 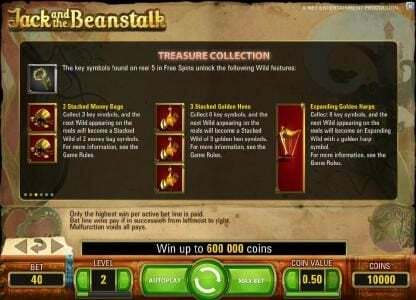 In order for the treasure to be unlocked, the player has to find different keys which are offered during the Bonus rounds with free spins. The three types of keys are Money Bags, Golden Hens and Golden Harps. 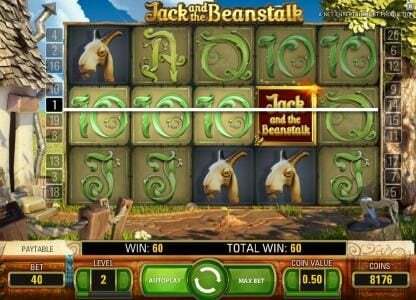 Thanks to the different interesting features, the fact that it has a good betting range and the great graphics, this Slot Machine should be considered one of the better models available. Do not use more than one free casino promotion as they may not pay you for violating terms and conditions. Wintingo is restricted in Belgium, Cayman Islands, Denmark, France, Israel, Italy, Japan, Poland, Saudi Arabia, Turkey, United Kingdom and United States countries. 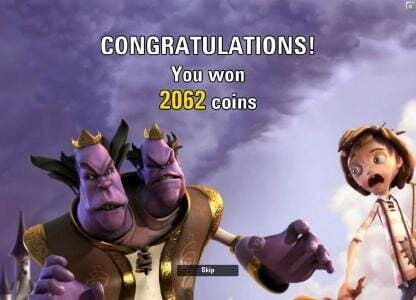 Be sure when you use a free casino bonus code from EU Casino as you know with run casinos, you have to post a deposit between free casino bonuses. Belgium, Cyprus, Denmark, France, Israel, Italy, Mexico, Spain, Turkey and United States countries are forbidden at EU casino. EU Casino terms state that you have to make a deposit between multiple free bonuses to be allowed to make a cash out. Casino Red Kings terms state that you have to make a qualifying deposit between multiple no deposit casino bonuses to be qualified to process a withdraw. Be sure when you use a free bonus code from Slots Magic casino as you know with powered Online Casinos, you must post a qualifying deposit if your last casino bonus was a no deposit one. Slots Magic casino is restricted in Belgium, Cyprus, Denmark, France, Israel, Mexico, Spain, Turkey and United States countries. Be sure you do not use more than one free promotion back to back as your balance could be voided without a deposit. Albania, Antigua and Barbuda, Argentina, Armenia, Azerbaijan, Bahrain, Bangladesh, Barbados, Belarus, Belgium, Bermuda, Bhutan, Bosnia and Herzegovina, Botswana, Bulgaria, Burkina Faso, Burundi, Cameroon, Cape Verde, Cayman Islands, Chile, Croatia, Cuba, Denmark, Ecuador, El Salvador, Equatorial Guinea, Estonia, Faroe Islands, France, French Polynesia, Georgia, Gibraltar, Greece, Greenland, Guadeloupe, Guatemala, Guinea, Guyana, Haiti, Honduras, Indonesia, Italy, Jamaica, Japan, Jersey, Kazakhstan, Kuwait, Latvia, Lebanon, Lesotho, Liechtenstein, Lithuania, Macedonia, Maldives, Mali, Martinique, Moldova, Mongolia, Nepal, New Caledonia, Nicaragua, Oman, Panama, Portugal, Qatar, Saint Kitts and Nevis, Saint Lucia, Saint Pierre and Miquelon, Saint Vincent and the Grenadines, Saudi Arabia, Serbia, Slovenia, South Africa, Spain, Suriname, Taiwan, Tajikistan, Trinidad and Tobago, Turkmenistan, Turks and Caicos Islands, Ukraine, United States, Uruguay, Uzbekistan, Venezuela and Wallis and Futuna locations are restricted at Mega Casino. Belgium, Cayman Islands, Denmark, France, Israel, Italy, Japan, Poland, Saudi Arabia, Turkey, United Kingdom and United States locations are not permitted to play at Wintingo casino. Trada requires that you must make a deposit between multiple Free Casino Bonuses to be qualified to make a cash out. Note that Afghanistan, Algeria, American Samoa, Belgium, Cayman Islands, Denmark, France, French Guiana, French Polynesia, Iran, Iraq, Israel, Italy, Japan, Martinique, Nigeria, Pakistan, Poland, Saint Pierre and Miquelon, Saudi Arabia, Sudan, Tunisia, Turkey, United States and Wallis and Futuna players are restricted at Trada. Take care you do not use multiple free promotions back to back as your balance may be voided without making a deposit. Note that Belgium, Cayman Islands, Denmark, France, Israel, Italy, Japan, Poland, Saudi Arabia, Turkey, United Kingdom and United States players are forbidden at Wintingo. 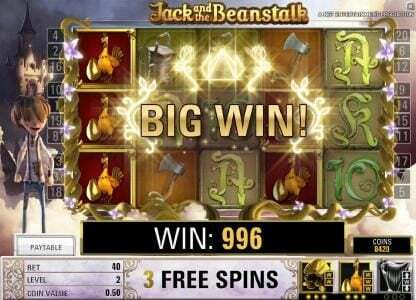 Do not use more than one free bonus as your winnings may be removed without making a deposit. Note that Belgium, Cayman Islands, Denmark, France, Israel, Italy, Japan, Poland, Saudi Arabia, Turkey, United Kingdom and United States players are not able to play at Wintingo. Be sure when you use a no deposit bonus code from Wintingo casino as with most Microgaming powered online casinos, you have to post a qualifying deposit if your last bonus was also a free one. Belgium, Cayman Islands, Denmark, France, Israel, Italy, Japan, Poland, Saudi Arabia, Turkey, United Kingdom and United States locations are not able to play at Wintingo casino. Take care you do not use more than one free Casino Bonus back to back as they may not pay you for violating the rules. Note that Aruba, France, Latvia, Saint Martin, United Kingdom and United States players are forbidden at My Win 24 Casino. video slots terms state that you must make a deposit between multiple free Bonuses to be qualified to process a withdraw. Note that Afghanistan, American Samoa, Argentina, Bahrain, Bangladesh, Belarus, Belgium, Bosnia and Herzegovina, China, Cuba, Cyprus, Denmark, Egypt, Eritrea, Germany, Guam, Haiti, Hong Kong, India, Iran, Iraq, Ireland, Israel, Jordan, Kazakhstan, Kenya, Kuwait, Lebanon, Liberia, Lithuania, Malaysia, Mozambique, Nepal, Nigeria, Northern Mariana Islands, Pakistan, Puerto Rico, Qatar, RÃ©union, Rwanda, Saint Martin, Saudi Arabia, Senegal, Singapore, Somalia, Sri Lanka, Sudan, Tanzania, Turkey, Ukraine, United Arab Emirates, United States, Venezuela, Vietnam, Yemen and Zimbabwe players are not able to play at Video Slots. Take care you do not use more than one free Casino Bonus at Wintingo as they may not pay you for not following terms. Note that Belgium, Cayman Islands, Denmark, France, Israel, Italy, Japan, Poland, Saudi Arabia, Turkey, United Kingdom and United States players are restricted at Wintingo. Be sure you do not use more than one free bonus back to back at My Win 24 as they may not pay you for not following the rules. My Win 24 Casino is prohibited in Aruba, France, Latvia, Saint Martin, United Kingdom and United States countries. Note that Aruba, France, Latvia, Saint Martin, United Kingdom and United States players are restricted at My Win 24 Casino. Do not use more than one no deposit Casino promotion back to back at Thrills as your winnings may be voided without making a deposit. Note that Algeria, China, Denmark, Ecuador, Faroe Islands, France, French Guiana, French Polynesia, Greenland, Guadeloupe, Hong Kong, Indonesia, Iran, Ireland, Italy, Malaysia, Martinique, Mayotte, New Caledonia, Portugal, RÃ©union, Romania, Saint Pierre and Miquelon, Singapore, Spain, Turkey, United States and Wallis and Futuna players are restricted at Thrills. Be sure you do not use multiple no deposit promotions at PropaWin as they may not pay you for not following terms. Do not use more than one free Bonus back to back at Free Spins as they may not pay you for not following terms and conditions. Note that Estonia, France, Italy, Spain and United States players are restricted at Free Spins. PropaWin requires that you have to make a deposit between no deposit bonuses to be able to make a cash out. Do not use more than one free promotion at My Win 24 as they may not pay you for not following terms and conditions. Note that Aruba, France, Latvia, Saint Martin, United Kingdom and United States players are not able to play at My Win 24. Do not use multiple No Deposit Casino promotions as your balance may be voided without making a deposit. Video slots casino is prohibited in Afghanistan, American Samoa, Argentina, Bahrain, Bangladesh, Belarus, Belgium, Bosnia and Herzegovina, China, Cuba, Cyprus, Denmark, Egypt, Eritrea, Germany, Guam, Haiti, Hong Kong, India, Iran, Iraq, Ireland, Israel, Jordan, Kazakhstan, Kenya, Kuwait, Lebanon, Liberia, Lithuania, Malaysia, Mozambique, Nepal, Nigeria, Northern Mariana Islands, Pakistan, Puerto Rico, Qatar, RÃ©union, Rwanda, Saint Martin, Saudi Arabia, Senegal, Singapore, Somalia, Sri Lanka, Sudan, Tanzania, Turkey, Ukraine, United Arab Emirates, United States, Venezuela, Vietnam, Yemen and Zimbabwe locations. Do not use more than one free Casino Bonus as your winnings may be removed without making a deposit. My Win 24 is restricted in Aruba, France, Latvia, Saint Martin, United Kingdom and United States countries. Do not use multiple no deposit bonuses back to back at Video Slots as they may not pay you for violating the rules. Afghanistan, American Samoa, Argentina, Bahrain, Bangladesh, Belarus, Belgium, Bosnia and Herzegovina, China, Cuba, Cyprus, Denmark, Egypt, Eritrea, Germany, Guam, Haiti, Hong Kong, India, Iran, Iraq, Ireland, Israel, Jordan, Kazakhstan, Kenya, Kuwait, Lebanon, Liberia, Lithuania, Malaysia, Mozambique, Nepal, Nigeria, Northern Mariana Islands, Pakistan, Puerto Rico, Qatar, RÃ©union, Rwanda, Saint Martin, Saudi Arabia, Senegal, Singapore, Somalia, Sri Lanka, Sudan, Tanzania, Turkey, Ukraine, United Arab Emirates, United States, Venezuela, Vietnam, Yemen and Zimbabwe locations are not permitted to play at video slots. Wintingo terms state that you have to make a deposit between Free Casino Bonuses to be able to process a cash out. Belgium, Cayman Islands, Denmark, France, Israel, Italy, Japan, Poland, Saudi Arabia, Turkey, United Kingdom and United States locations are forbidden at Wintingo. Be sure you do not use more than one free promotion at PropaWin as your balance may be removed without a deposit. PropaWin terms state that you have to make a qualifying deposit between No Deposit Casino Bonuses to be able to process a withdraw. Be sure you do not use multiple free promotions back to back as they may not pay you for violating terms and conditions. Video slots casino is restricted in Afghanistan, American Samoa, Argentina, Bahrain, Bangladesh, Belarus, Belgium, Bosnia and Herzegovina, China, Cuba, Cyprus, Denmark, Egypt, Eritrea, Germany, Guam, Haiti, Hong Kong, India, Iran, Iraq, Ireland, Israel, Jordan, Kazakhstan, Kenya, Kuwait, Lebanon, Liberia, Lithuania, Malaysia, Mozambique, Nepal, Nigeria, Northern Mariana Islands, Pakistan, Puerto Rico, Qatar, RÃ©union, Rwanda, Saint Martin, Saudi Arabia, Senegal, Singapore, Somalia, Sri Lanka, Sudan, Tanzania, Turkey, Ukraine, United Arab Emirates, United States, Venezuela, Vietnam, Yemen and Zimbabwe locations. Prime Slots requires that you must make a deposit between No Deposit Casino Bonuses to be able to make a withdraw. Prime Slots is prohibited in Albania, Antigua and Barbuda, Argentina, Armenia, Azerbaijan, Bahrain, Bangladesh, Barbados, Belarus, Belgium, Bermuda, Bhutan, Bosnia and Herzegovina, Botswana, Bulgaria, Burkina Faso, Burundi, Cameroon, Cape Verde, Cayman Islands, Chile, Croatia, Cuba, Denmark, Ecuador, Egypt, El Salvador, Equatorial Guinea, Estonia, Faroe Islands, France, French Polynesia, Georgia, Gibraltar, Greece, Greenland, Guadeloupe, Guatemala, Guinea, Guyana, Haiti, Honduras, Hungary, Indonesia, Jamaica, Japan, Jersey, Kazakhstan, Kuwait, Latvia, Lebanon, Lesotho, Liechtenstein, Lithuania, Macedonia, Maldives, Mali, Martinique, Moldova, Mongolia, Nepal, New Caledonia, Nicaragua, Oman, Panama, Portugal, Qatar, Romania, Saint Kitts and Nevis, Saint Lucia, Saint Pierre and Miquelon, Saint Vincent and the Grenadines, Saudi Arabia, Serbia, Slovenia, South Africa, Spain, Suriname, Taiwan, Tajikistan, Trinidad and Tobago, Turkmenistan, Turks and Caicos Islands, Ukraine, United States, Uruguay, Uzbekistan, Venezuela, Vietnam and Wallis and Futuna countries. Be sure you do not use multiple free promotions back to back at Video Slots as your balance may be removed without making a deposit. My Win 24 terms state that you have to make a deposit between no deposit bonuses to be able to make a cash out. Aruba, France, Latvia, Saint Martin, United Kingdom and United States locations are forbidden at My Win 24 casino. Do not use multiple No Deposit Casino promotions at PropaWin as your winnings may be removed without a deposit. Do not use more than one no deposit promotion back to back at PropaWin as your winnings could be removed without a deposit. Be sure you do not use more than one free Casino promotion at Video Slots as they may not pay you for not following terms. Afghanistan, American Samoa, Argentina, Bahrain, Bangladesh, Belarus, Belgium, Bosnia and Herzegovina, China, Cuba, Cyprus, Denmark, Egypt, Eritrea, Germany, Guam, Haiti, Hong Kong, India, Iran, Iraq, Ireland, Israel, Jordan, Kazakhstan, Kenya, Kuwait, Lebanon, Liberia, Lithuania, Malaysia, Mozambique, Nepal, Nigeria, Northern Mariana Islands, Pakistan, Puerto Rico, Qatar, RÃ©union, Rwanda, Saint Martin, Saudi Arabia, Senegal, Singapore, Somalia, Sri Lanka, Sudan, Tanzania, Turkey, Ukraine, United Arab Emirates, United States, Venezuela, Vietnam, Yemen and Zimbabwe locations are forbidden at Video slots casino. Do not use more than one free bonus at PropaWin as they may not pay you for not following the rules. Be sure when you use a free Casino Bonus code from PropaWin casino as with most Games OS, Ash Gaming, Playtech, Genesis Gaming, NextGen, Net Entertainment and Microgaming powered casinos, you must make a qualifying deposit if the last bonus was also a no deposit one. Afghanistan, American Samoa, Argentina, Bahrain, Bangladesh, Belarus, Belgium, Bosnia and Herzegovina, China, Cuba, Cyprus, Denmark, Egypt, Eritrea, Germany, Guam, Haiti, Hong Kong, India, Iran, Iraq, Ireland, Israel, Jordan, Kazakhstan, Kenya, Kuwait, Lebanon, Liberia, Lithuania, Malaysia, Mozambique, Nepal, Nigeria, Northern Mariana Islands, Pakistan, Puerto Rico, Qatar, RÃ©union, Rwanda, Saint Martin, Saudi Arabia, Senegal, Singapore, Somalia, Sri Lanka, Sudan, Tanzania, Turkey, Ukraine, United Arab Emirates, United States, Venezuela, Vietnam, Yemen and Zimbabwe countries are restricted at Video slots casino. 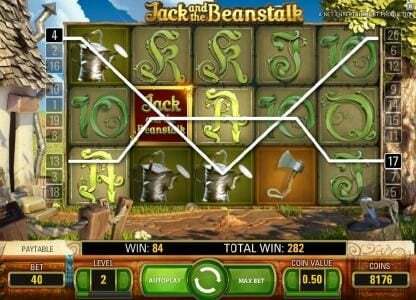 Be sure when you use a No Deposit Casino bonus code from video slots casino as you know with Casino Technology, iSoftBet, Endorphina, Bally Gaming, Games OS, Yggdrasil, 1X2 Gaming, wms, Aristocrat, Thunderkick, Lightning Box, 2by2 Gaming, Elk Studios, Rival, Big Time Gaming, Leander, Rabcat, CryptoLogic, Genesis Gaming, Quickspin, Bet Soft, NextGen, Net Entertainment and Microgaming powered Online Casinos, you have to make a deposit if your last bonus was also a free one. Note that Afghanistan, American Samoa, Argentina, Bahrain, Bangladesh, Belarus, Belgium, Bosnia and Herzegovina, China, Cuba, Cyprus, Denmark, Egypt, Eritrea, Germany, Guam, Haiti, Hong Kong, India, Iran, Iraq, Ireland, Israel, Jordan, Kazakhstan, Kenya, Kuwait, Lebanon, Liberia, Lithuania, Malaysia, Mozambique, Nepal, Nigeria, Northern Mariana Islands, Pakistan, Puerto Rico, Qatar, RÃ©union, Rwanda, Saint Martin, Saudi Arabia, Senegal, Singapore, Somalia, Sri Lanka, Sudan, Tanzania, Turkey, Ukraine, United Arab Emirates, United States, Venezuela, Vietnam, Yemen and Zimbabwe players are forbidden at Video Slots casino. Be sure when you use a No Deposit Casino bonus code from PropaWin Casino as you know with Games OS, Ash Gaming, Playtech, Genesis Gaming, NextGen, Net Entertainment and Microgaming operated casinos, you are required to make a qualifying deposit between No Deposit Casino Bonuses. Do not use multiple free promotions back to back at PropaWin as they may not pay you for not following the rules. Note that Afghanistan, American Samoa, Argentina, Bahrain, Bangladesh, Belarus, Belgium, Bosnia and Herzegovina, China, Cuba, Cyprus, Denmark, Egypt, Eritrea, Germany, Guam, Haiti, Hong Kong, India, Iran, Iraq, Ireland, Israel, Jordan, Kazakhstan, Kenya, Kuwait, Lebanon, Liberia, Lithuania, Malaysia, Mozambique, Nepal, Nigeria, Northern Mariana Islands, Pakistan, Puerto Rico, Qatar, RÃ©union, Rwanda, Saint Martin, Saudi Arabia, Senegal, Singapore, Somalia, Sri Lanka, Sudan, Tanzania, Turkey, Ukraine, United Arab Emirates, United States, Venezuela, Vietnam, Yemen and Zimbabwe players are not allowed to play at Video slots casino. Be sure you do not use multiple free promotions back to back as they may not pay you for not following the rules. Casino Superlines is restricted in United Kingdom and United States locations. Take care you do not use more than one free bonus as they may not pay you for not following terms. Video Slots terms state that you have to make a qualifying deposit between multiple no deposit bonuses to be qualified to process a withdraw. Video slots casino is prohibited in Afghanistan, American Samoa, Argentina, Bahrain, Bangladesh, Belarus, Belgium, Bosnia and Herzegovina, China, Cuba, Cyprus, Denmark, Egypt, Eritrea, Germany, Guam, Haiti, Hong Kong, India, Iran, Iraq, Ireland, Israel, Jordan, Kazakhstan, Kenya, Kuwait, Lebanon, Liberia, Lithuania, Malaysia, Mozambique, Nepal, Nigeria, Northern Mariana Islands, Pakistan, Puerto Rico, Qatar, RÃ©union, Rwanda, Saint Martin, Saudi Arabia, Senegal, Singapore, Somalia, Sri Lanka, Sudan, Tanzania, Turkey, Ukraine, United Arab Emirates, United States, Venezuela, Vietnam, Yemen and Zimbabwe countries. Note that United Kingdom and United States players are restricted at Orientxpress Casino. Be sure when you use a free bonus code from Wixstars casino as with most Net Entertainment, Microgaming and Evolution Gaming run casinos, you must make a qualifying deposit if your last Casino Bonus was a free one. Do not use more than one free bonus as they may not pay you for violating terms and conditions. video slots terms state that you must make a qualifying deposit between free Bonuses to be able to process a cash out. Note that Afghanistan, American Samoa, Argentina, Bahrain, Bangladesh, Belarus, Belgium, Bosnia and Herzegovina, China, Cuba, Cyprus, Denmark, Egypt, Eritrea, Germany, Guam, Haiti, Hong Kong, India, Iran, Iraq, Ireland, Israel, Jordan, Kazakhstan, Kenya, Kuwait, Lebanon, Liberia, Lithuania, Malaysia, Mozambique, Nepal, Nigeria, Northern Mariana Islands, Pakistan, Puerto Rico, Qatar, RÃ©union, Rwanda, Saint Martin, Saudi Arabia, Senegal, Singapore, Somalia, Sri Lanka, Sudan, Tanzania, Turkey, Ukraine, United Arab Emirates, United States, Venezuela, Vietnam, Yemen and Zimbabwe players are restricted at Video slots casino. 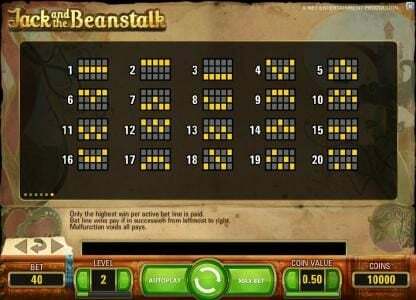 Video Slots requires that you must make a deposit between multiple free Bonuses to be allowed to make a withdraw. video slots is restricted in Afghanistan, American Samoa, Argentina, Bahrain, Bangladesh, Belarus, Belgium, Bosnia and Herzegovina, China, Cuba, Cyprus, Denmark, Egypt, Eritrea, Germany, Guam, Haiti, Hong Kong, India, Iran, Iraq, Ireland, Israel, Jordan, Kazakhstan, Kenya, Kuwait, Lebanon, Liberia, Lithuania, Malaysia, Mozambique, Nepal, Nigeria, Northern Mariana Islands, Pakistan, Puerto Rico, Qatar, RÃ©union, Rwanda, Saint Martin, Saudi Arabia, Senegal, Singapore, Somalia, Sri Lanka, Sudan, Tanzania, Turkey, Ukraine, United Arab Emirates, United States, Venezuela, Vietnam, Yemen and Zimbabwe locations. Do not use more than one free promotion at Wixstars as your winnings may be voided without making a deposit. Be sure you do not use more than one No Deposit Casino bonus at Video Slots as they may not pay you for violating terms and conditions. 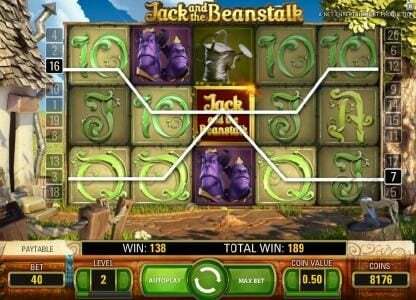 Do not use multiple Free Casino Bonuses at video slots as your winnings may be voided without a deposit. Note that Afghanistan, American Samoa, Argentina, Bahrain, Bangladesh, Belarus, Belgium, Bosnia and Herzegovina, China, Cuba, Cyprus, Denmark, Egypt, Eritrea, Germany, Guam, Haiti, Hong Kong, India, Iran, Iraq, Ireland, Israel, Jordan, Kazakhstan, Kenya, Kuwait, Lebanon, Liberia, Lithuania, Malaysia, Mozambique, Nepal, Nigeria, Northern Mariana Islands, Pakistan, Puerto Rico, Qatar, RÃ©union, Rwanda, Saint Martin, Saudi Arabia, Senegal, Singapore, Somalia, Sri Lanka, Sudan, Tanzania, Turkey, Ukraine, United Arab Emirates, United States, Venezuela, Vietnam, Yemen and Zimbabwe players are not allowed to play at Video Slots. Do not use multiple free Casino promotions back to back as they may not pay you for not following terms and conditions. Note that Afghanistan, Albania, Algeria, Angola, Belgium, Bulgaria, Cambodia, Ecuador, Estonia, France, Guinea, Guyana, Hong Kong, Indonesia, Iran, Israel, Italy, Kuwait, Latvia, Mexico, Namibia, Nicaragua, North Korea, Oman, Pakistan, Panama, Philippines, Portugal, Singapore, South Africa, South Korea, Spain, Sudan, Syria, Taiwan, Uganda, United Kingdom, United States, Yemen and Zimbabwe players are not allowed to play at Argo casino. Take care you do not use more than one No Deposit Casino bonus at Wixstars as your winnings could be voided without a deposit. Take care you do not use multiple free Bonuses as your balance may be voided without making a deposit. Note that Afghanistan, American Samoa, Argentina, Bahrain, Bangladesh, Belarus, Belgium, Bosnia and Herzegovina, China, Cuba, Cyprus, Denmark, Egypt, Eritrea, Germany, Guam, Haiti, Hong Kong, India, Iran, Iraq, Ireland, Israel, Jordan, Kazakhstan, Kenya, Kuwait, Lebanon, Liberia, Lithuania, Malaysia, Mozambique, Nepal, Nigeria, Northern Mariana Islands, Pakistan, Puerto Rico, Qatar, RÃ©union, Rwanda, Saint Martin, Saudi Arabia, Senegal, Singapore, Somalia, Sri Lanka, Sudan, Tanzania, Turkey, Ukraine, United Arab Emirates, United States, Venezuela, Vietnam, Yemen and Zimbabwe players are forbidden at Video Slots. 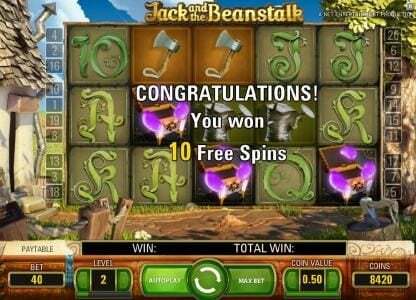 Be sure when you use a No Deposit Casino Bonus code from video slots as with most Yggdrasil, wms, Thunderkick, Rival, Rabcat, Quickspin, NextGen, Net Entertainment, Microgaming, Lightning Box, Leander, iSoftBet, Genesis Gaming, Games OS, Endorphina, Elk Studios, CryptoLogic, Casino Technology, Big Time Gaming, Bet Soft, Bally Gaming, Aristocrat, 2by2 Gaming and 1X2 Gaming operated casinos, you must make a deposit between free Online Casino promotions. Be sure you do not use multiple free casino promotions back to back at Wixstars as they may not pay you for violating terms. Take care you do not use multiple No Deposit Casino promotions at video slots as your balance may be voided without a deposit. 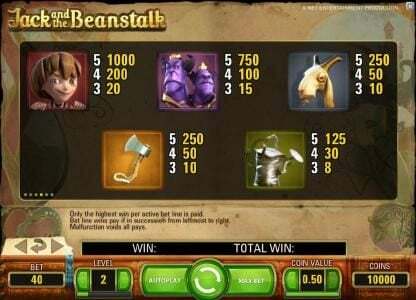 Be sure when you use a free Bonus code from Video Slots as with most Yggdrasil, wms, Thunderkick, Rival, Rabcat, Quickspin, NextGen, Net Entertainment, Microgaming, Lightning Box, Leander, iSoftBet, Genesis Gaming, Games OS, Endorphina, Elk Studios, CryptoLogic, Casino Technology, Big Time Gaming, Bet Soft, Bally Gaming, Aristocrat, 2by2 Gaming and 1X2 Gaming run Online Casinos, you must make a deposit between no deposit Online Casino Bonuses. Videoslots terms state that you have to make a qualifying deposit between no deposit bonuses to be allowed to make a cash out. Note that Afghanistan, American Samoa, Argentina, Bahrain, Bangladesh, Belarus, Belgium, Bosnia and Herzegovina, China, Cuba, Cyprus, Denmark, Egypt, Eritrea, Germany, Guam, Haiti, Hong Kong, India, Iran, Iraq, Ireland, Israel, Jordan, Kazakhstan, Kenya, Kuwait, Lebanon, Liberia, Lithuania, Malaysia, Mozambique, Nepal, Nigeria, Northern Mariana Islands, Pakistan, Puerto Rico, Qatar, RÃ©union, Rwanda, Saint Martin, Saudi Arabia, Senegal, Singapore, Somalia, Sri Lanka, Sudan, Tanzania, Turkey, Ukraine, United Arab Emirates, United States, Venezuela, Vietnam, Yemen and Zimbabwe players are forbidden at Videoslots. Videoslots requires that you must make a deposit between multiple Free Casino Bonuses to be allowed to make a cash out. Note that Afghanistan, American Samoa, Argentina, Bahrain, Bangladesh, Belarus, Belgium, Bosnia and Herzegovina, China, Cuba, Cyprus, Denmark, Egypt, Eritrea, Germany, Guam, Haiti, Hong Kong, India, Iran, Iraq, Ireland, Israel, Jordan, Kazakhstan, Kenya, Kuwait, Lebanon, Liberia, Lithuania, Malaysia, Mozambique, Nepal, Nigeria, Northern Mariana Islands, Pakistan, Puerto Rico, Qatar, RÃ©union, Rwanda, Saint Martin, Saudi Arabia, Senegal, Singapore, Somalia, Sri Lanka, Sudan, Tanzania, Turkey, Ukraine, United Arab Emirates, United States, Venezuela, Vietnam, Yemen and Zimbabwe players are forbidden at Videoslots Casino. Wixstars terms state that you have to make a deposit between No Deposit Casino Bonuses to be able to process a cash out. Do not use more than one no deposit promotion back to back at Videoslots as your winnings could be voided without a deposit. Afghanistan, American Samoa, Argentina, Bahrain, Bangladesh, Belarus, Belgium, Bosnia and Herzegovina, China, Cuba, Cyprus, Denmark, Egypt, Eritrea, Germany, Guam, Haiti, Hong Kong, India, Iran, Iraq, Ireland, Israel, Jordan, Kazakhstan, Kenya, Kuwait, Lebanon, Liberia, Lithuania, Malaysia, Mozambique, Nepal, Nigeria, Northern Mariana Islands, Pakistan, Puerto Rico, Qatar, RÃ©union, Rwanda, Saint Martin, Saudi Arabia, Senegal, Singapore, Somalia, Sri Lanka, Sudan, Tanzania, Turkey, Ukraine, United Arab Emirates, United States, Venezuela, Vietnam, Yemen and Zimbabwe countries are not allowed to play at Videoslots Casino. Videoslots requires that you must make a deposit between no deposit bonuses to be able to process a cash out. Videoslots casino is prohibited in Afghanistan, American Samoa, Argentina, Bahrain, Bangladesh, Belarus, Belgium, Bosnia and Herzegovina, China, Cuba, Cyprus, Denmark, Egypt, Eritrea, Germany, Guam, Haiti, Hong Kong, India, Iran, Iraq, Ireland, Israel, Jordan, Kazakhstan, Kenya, Kuwait, Lebanon, Liberia, Lithuania, Malaysia, Mozambique, Nepal, Nigeria, Northern Mariana Islands, Pakistan, Puerto Rico, Qatar, RÃ©union, Rwanda, Saint Martin, Saudi Arabia, Senegal, Singapore, Somalia, Sri Lanka, Sudan, Tanzania, Turkey, Ukraine, United Arab Emirates, United States, Venezuela, Vietnam, Yemen and Zimbabwe locations. I played the free demo game here and I love the game. I could see myself playing this game for real money a lot. I would rate this slot a 9 out of 10. This slot has a free spins round and the wilds are awesome. This slot was fun. 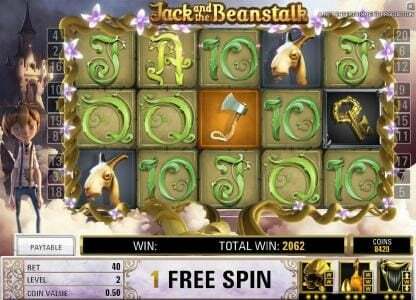 I like the "Jack and the Beanstalk" symbol where you get repeat spins, as it works it's way across the reels !! !